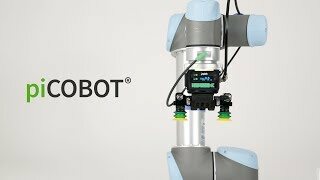 Extending the reach of cobots, Piab's piCOBOT® enables safe and effective human-robot interaction. Taby, Sweden – Piab is proud to introduce piCOBOT®, a cleverly equipped end-of-arm (EOAT) vacuum tool designed specifically for the cobot market. Featuring the company's signature vacuum technology, enabling improved efficiency, productivity and working environments, piCOBOT® offers industry certified plug-and-play extensions to the latest collaborative robots, so called cobots. Offered as a development kit, piCOBOT® comprises a vacuum pump unit, a gripper unit and two suction cups. The standard kit includes four different sets of suction cup models suitable for a variety of tasks, but customers can also choose freely from the company's extensive range of suction cups for more tailored solutions. Certified by Universal Robots, piCOBOT® builds on the idea of safe and flexible human-robot workplace interaction, found to be much more productive than either of them working on their own. Soft design lines guarantee that no one is injured if colliding with piCOBOT®. With a piCOBOT® unique URCaps installation, programming time is decreased to a minimum for the customer. Designed for maximum flexibility and reach, piCOBOT®'s 3.87-5.71"wide and +/-15 degree tiltable gripper arms can be fitted with two suction cups. Alternatively, the gripper can be replaced by a single suction cup mount directly on the piCOBOT® pump unit. For optional single or double object picking, dedicated sense valves ensure safe operation regardless of mode. While a compact format and low build height of 2.71" allow use in space-restricted areas, the low weight of Piab's solution offers a great advantage compared with similar competing systems. ”piCOBOT® weighs only 18 oz. and the gripper only adds another 7.40 oz. This provides maximum payload capacity for the cobot,” explains Josef Karbassi, Vice President of Piab's Automation Division. Strong for its size, piCOBOT® is able to lift objects weighing up to 15.5 lbs..
piCOBOT® – Small, powerful and ready to collaborate with human and cobot workers!